Phillip St. John Basil Rathbone was born on this date in 1892. To many Sherlockians, including your author, he is the personification of Sherlock Holmes. In this post, we will discuss his service in the British military during World War I and the honors and decorations he received for his service. In Rathbone’s 1962 autobiography, In and Out of Character, he recounts much of his military service within the first 15 pages. When war was declared in August 1914, he expressed some hesitancy to enlist in the military. His younger brother, John, would quit school the following May and in less than a month later would be appointed as a Captain after completing training. Rathbone enlisted on March 31, 1916 as a Private and started training. Rathbone applied for a commission and was sent to officer’s training in Scotland. After completing his training, Rathbone received his commission as a Second Lieutenant in the Second Battalion of the King’s Liverpool Regiment. This unit was attached to the Fifty-Seventh Division, and was held in England for several months. John Rathbone was seriously wounded at the Battle of the Somme in July 1916, suffering wounds to his chest and right lung. Basil Rathbone would contract measles in February 1917. After spending a week at a military hospital, Basil would be sent back to London to recuperate at home with his brother John. After several weeks, Basil was well enough to report for duty and was sent abroad. On May 23, 1917 he reported for duty in B Company, stationed in the trenches near Bois-Grenier of France. Rathbone would serve as a Patrols Officer, working closely with those in charge of gathering intelligence. Basil and John’s mother passed away during 1917. John Rathbone would eventually be healthy enough to return to the front lines in early 1918. Basil was leading nighttime forays into the No Man’s Land area between the British and German trenches to gather information about the German’s activities. John would be killed in action on June 4, 1918. Shortly after this, Basil convinced his superiors to allow him to scout enemy positions during daylight rather than at night, as was the usual practice to minimize the chance of detection. There is some question about Basil’s state of mind with everything that had happened in the previous year. Could he have been having feelings of guilt or possibly seeking vengeance? For more information about Basil’s military service, check out Basil Rathbone and The Great War. Basil would describe these daylight missions in an January 11, 1957 interview on Edward R. Murrow’s Person to Person show. His commanding officers sent reports to the War Offices praising Rathbone and the daylight patrols. Basil Rathbone would be awarded the Military Cross for bravery, as listed in the November 7, 1918 issue of The London Gazette. The Military Cross was created December 28, 1914 to recognize “an act or acts of exemplary gallantry during active operations against the enemy on land to all members, of any rank in Our Armed Forces.” At the time, only commissioned officers with the rank of Captain or less were eligible for the award. All ranks became eligible for the honor in 1993. The ornamental silver cross has straight arms terminating in broad finials, suspended from plain suspension bar. The uniface medal is 46mm high by 44mm wide and features 4 imperial crown and the royal cypher of King George V (GR). The ribbon is 32mm wide and consists of three equal vertical stripes of white, purple, and white. 48,000 medals were awarded during the reign of George V.
The British War Medal was created on July 26, 1919 to award those who had rendered service between August 5, 1914, the day following Britain’s declaration of war against Germany, and the armistice of November 11, 1918. 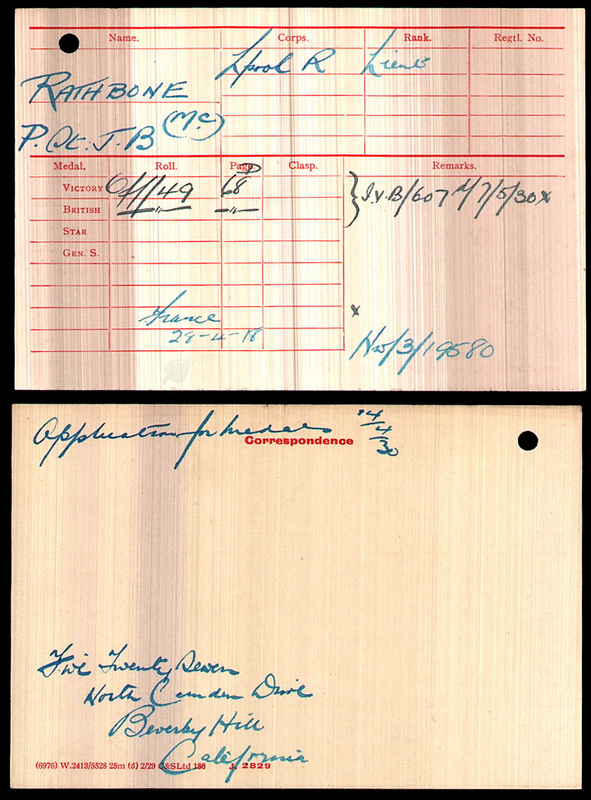 For those who served in the Army, such as Rathbone had done, recipients had to have completed 28 days mobilised service in an active theater of war. John Rathbone’s next of kin would also have received this medal. The 36mm silver medal has a straight clasp suspender without swivel, suspended from a 32mm wide watered silk ribbon, with a 3mm wide royal blue band, a 2mm wide black band and a 3mm wide white band, repeated in reverse order and separated by a 16mm wide orange band. The recipient’s name, rank, service number and unit are impressed on the bottom edge of the medal. On medals awarded to Army officers, with the exception of the Royal Artillery, the name of the regiment or corps was omitted. 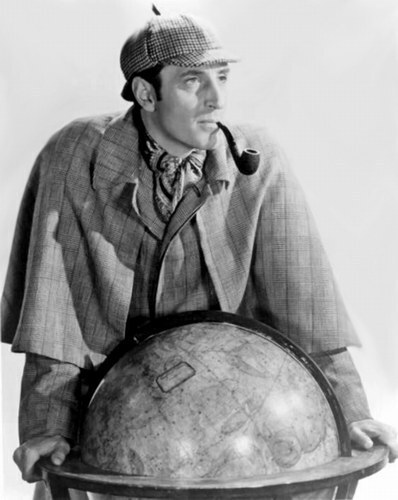 So, if we ever find Rathbone’s personal medal, it would only list his name, rank and service number. 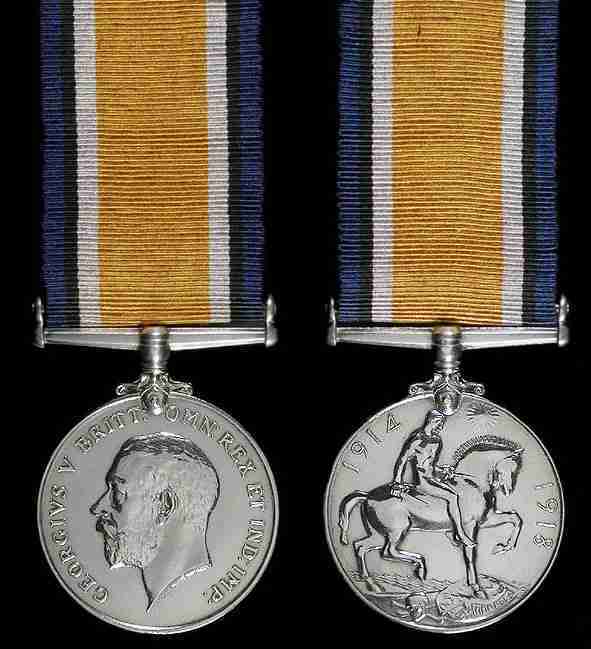 The obverse of the medal features King George V facing left, while the reverse features a naked St. George on horseback and armed with a short sword. The horse tramples on the Prussian eagle shield and a skull and cross-bones. In the background, are ocean waves and the rising sun of Victory. The years “1914” and “1918” appear on the perimeter. Approximately 6,500,000 medals were struck. 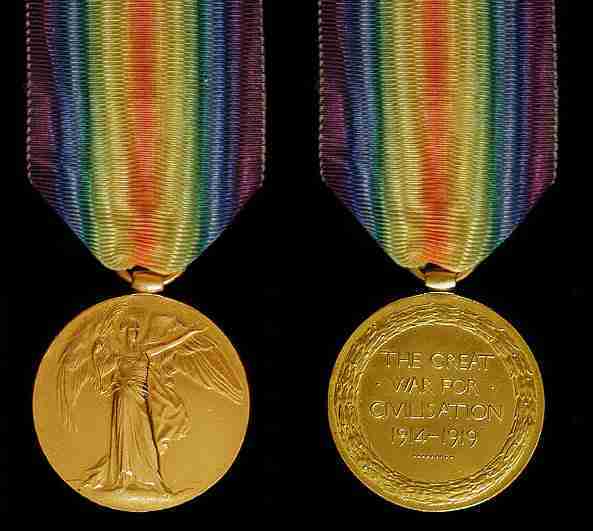 The Victory Medal has the same award criteria as the just-discussed British War Medal and was created on September 1, 1919. The victorious allied forces decided during the negotiations for the Treaty of Versailles to each issue a medal commemorating their victory with a personification of winged victory. Similar medals can be found for the other 14 allied countries. The 36mm copper medal is suspended from a 39mm wide ribbon with a ‘two rainbow’ design, with the violet from each rainbow on the outside edges moving through to a central red stripe where both rainbows meet. The obverse features the winged Victory at the center of the Queen Victoria memorial in London. The reverse features the legend THE GREAT WAR FOR CIVILISATION 1914 – 1919 within a laurel wreath. An oak leaf can be found on some of the ribbons. This indicates that the medal recipient had been mentioned in a dispatch, where the name appears in an official report written by a superior officer and sent to the high command, in which is described the soldier’s gallant or meritorious action in the face of the enemy. Having been awarded the Military Cross, Rathbone would be eligible for the oak leaf on his decoration. This World War One Medal Index Card lists the medal entitlements for Basil Rathbone and appears to be circa 1930. 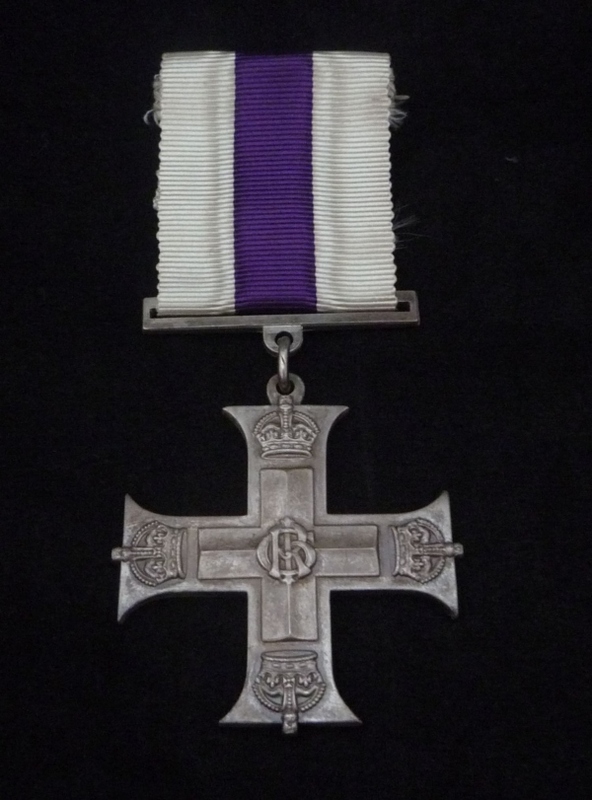 It confirms the two awards and the Military Cross.